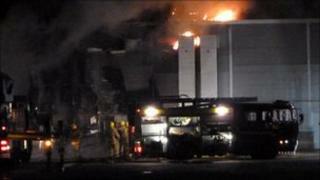 Three shops at a retail park in Eastbourne have been damaged by a fire which broke out at the back of Boots. More than 80 firefighters were at the Crumbles Retail Park, in Sovereign Harbour, at the height of the blaze which started at 2030 GMT on Saturday. East Sussex Fire and Rescue Service said crews arrived to find the fire had spread into the Boots store. Shoppers and staff were evacuated from the store, which was open, but there were no reports of injuries. Firefighters managed to stop the blaze spreading to adjoining shops, but two neighbouring stores were damaged by smoke. A fire service spokesman said the retail park was open on Sunday, but parking would be restricted while crews remained on the scene to damp down the fire and monitor hot spots. The cause of the fire is being investigated. A spokeswoman for Boots said the company was working closely with police and fire officers. The store will be closed until further notice.